The Park of Monsters. Photo by Reda and Co.
You know the site. Now you can keep it on your bedside table. We've been fans of since it launched in 2009, so we didn't waste any time getting hold of their book. The tome packs over 600 unique, strange, and fascinating sites from all corners of the earth. Page through it to discover destinations for your must-see list, conversation starters, road trip stops, and colorful brain candy. Each entry offers a brief description of the curiosity as well as information on how to find it and what's nearby. If the book proves anything, it's this: Just when you think you've seen the weirdest thing you'll ever see, there's always something weirder around the corner (or on the next page). 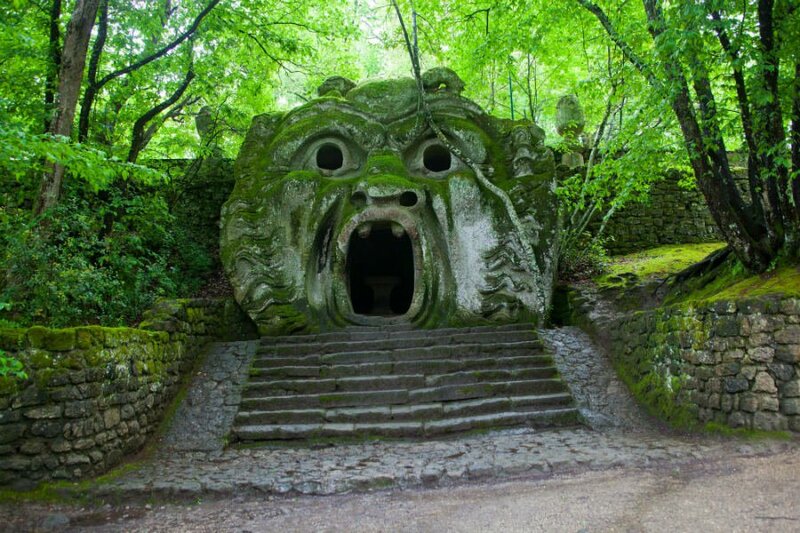 To follow are excerpts of some of our favorite weird and wild wonders. Deyrolle Taxidermy. Photo by Paul Léger. 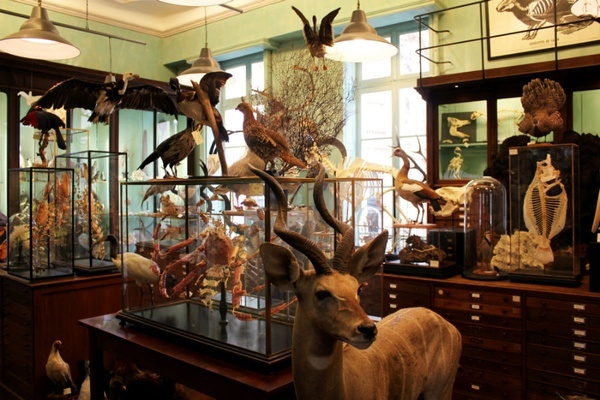 Exotic taxidermy, entomology, and natural history collections displayed in antique wooden cases and glass bell jars have made this store a destination for Parisians ever since it opened in 1881. In 2007, many of the animals were reduced to blackened fragments after a fire tore through the store. With the help of artists and collectors worldwide, the shop is back in business, and today houses everything from stuffed house cats to polar bears among its 19th-century decor. Though some of the more exotic animals are not for sale, you can always borrow a lion for a party — almost everything in the store is available for rent. Door to Hell. Photo by Tim Whitby. When darkness falls, an orange glow illuminates the dusty plains outside of Derweze, a settlement of 350 in the middle of the Karakum Desert. The source of light is the "Door to Hell," a 200-foot-wide (61-meter) crater that has been burning for over 45 years. In 1971, Soviet geologists, looking for natural gas, accidentally burrowed into a huge cavern filled with methane, causing the ground to crumble and their drilling rig to collapse into the huge pit. With the pocket of gas punctured, poisonous fumes began leaking from the hole at an alarming rate. To avoid a potential environmental catastrophe, the geologists set the hole on fire. The crater has been burning ever since. 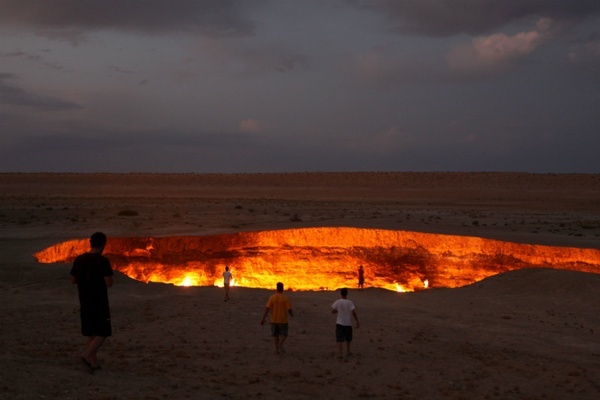 Following a visit to the Door to Hell in April 2010, Turkmen president Gurbanguly Berdimuhamedow recommended the hole be closed so the area's rich gas reserves can be tapped safely. Thus far the crater remains untouched, but with new pipelines and increased international interest in Turkmen gas reserves, the Door to Hell may not be open for much longer. 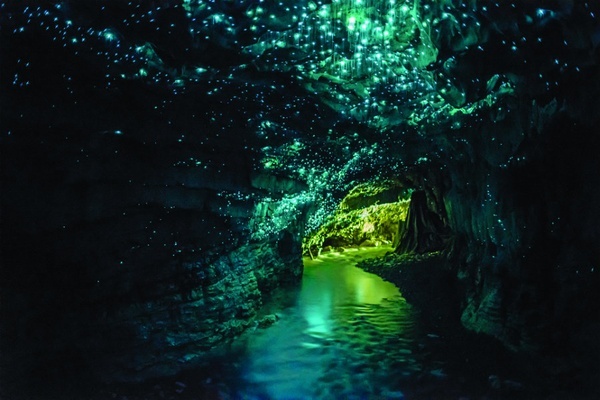 Waitomo Glowworm Caves. Photo by Martin Rietze. The tour of Waitomo’s glowworm caves ends with a silent boat ride in the dark beneath a dense scattering of blue-tinged stars. Or at least that's what it looks like. The dots of light on the ceiling are actually bioluminescent fungus gnats. This remarkable sight greeted local Maori chief Tane Tinorau and English surveyor Fred Mace when they explored the Waitomo caves for the first time in 1887. Entering through a stream and paddling on a raft by candlelight, the two men were astonished to discover the beauty of the caves, which formed approximately 30 million years ago. Return visits yielded greater rewards — the pair found an entry point on land and, by 1889, were guiding visitors through the caves for a small fee. The Waitomo caves contain magnificent natural limestone formations that resemble cathedrals, pipe organs, and twisted columns. But the main attraction is, of course, the glowworms. Found only in New Zealand, Arachnocampa luminosa emit a blue-green light during their 6-to-12-month larval stage. The bio-luminescence occurs due to chemical reactions in the gnat's excretory organs, and, along with dangling ing lines, helps attract prey to the silk webs where the larvae live. The hungrier a larva is, the more brightly it glows. These are the gnat's glory days — after emerging from the pupal stage mouthless, they will die of starvation within 100 hours, devoting their short adult life to mating and, if female, laying about a hundred or so eggs. Buy by Joshua Foer, Dylan Thuras, and Ella Morton. 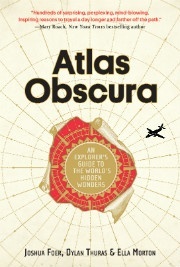 Excerpted from Atlas Obscura: An Explorer's Guide to the World's Hidden Wonders by Joshua Foer, Dylan Thuras, and Ella Morton (Workman Publishing). Copyright © 2016.